I wanted to share my review of Lian yuan Kuan Whitening mask I got from sasa.com! ooh! Thanks for the review, i might have to pick up this mask. i know they have been sold out for a while. Thanks for the review! Looks flawless <3 been lemming some whitening products lately hehe. Wow, I definitely see the brightening effect! What a great price too. Thanks for the review. I've posted about the earrings I purchased too :) love them!! And you look amazing dispite you saying 'super tired looking face'. wah, the result was amazing! your skin glows! ^^ great review! Im so glad I came across ur blog! 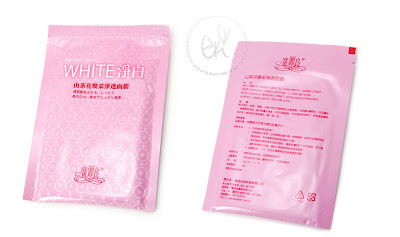 Ive been searching for a good brightening mask~ Will definitely give this one a try ^^ thanks! Hi Eki, nice review on the mask!! Right now i'm loving masks from watsons, this green tea one and this bird nest one really good! I always wondered about the whitening products I saw. It's nice to see a blog post about the mask. It does make your skin brighter. Pretty! i agree... you are glowing! wow! your skin really glow in the 'after' pic! I will try to get my hands on them! I love a good and cheap face mask! Erica, love it! I'm going to Taiwan soon and will definitely pick these up!